Has 1/3 of summer passed you by and you can’t even believe it? So it’s not just me then! Ha! Over at Homemaker’s Challenge, I posted about creating a summer bucket list. I LOVE summer. You couldn’t even begin to imagine how much I love it. After a week or two of 50 degree temps in April, we STILL had a ton of snow. May is usually still on the cold side for me, so summer is really only 3 months long. We get our summer mileage by having a summer bucket list. 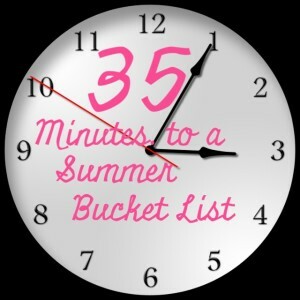 Go check out all of 35 Minutes to Creating a Summer Bucket List over at Homemaker’s Challenge!